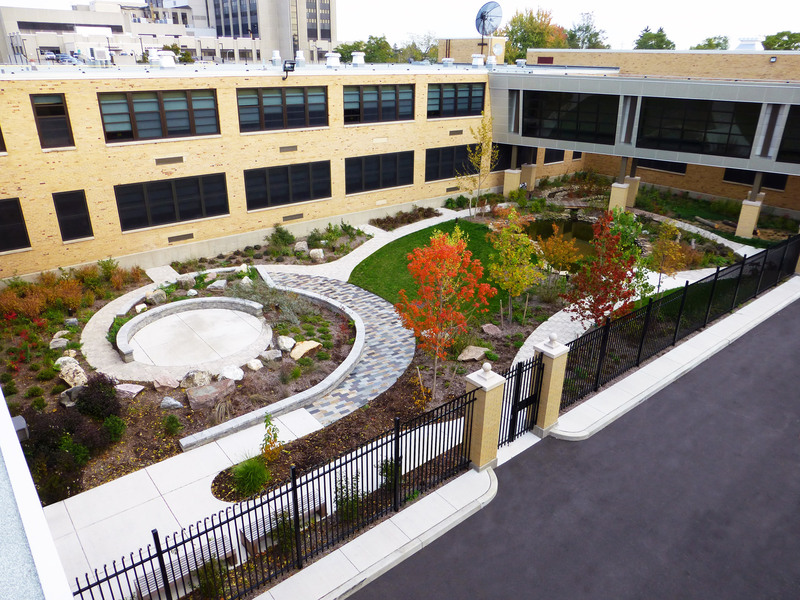 The landscape architect was responsible for the overall site design to transform a 6000 sf utility courtyard with very shallow bedrock into a functioning outdoor classroom and was involved from schematic design through construction documents as well as construction administration. The design of each individual ecosystem element needed to accommodate both large and small groups, and provide individual armatures for lab practicals to occur all while working as a cohesive design to provide an accessible and inviting classroom environment. 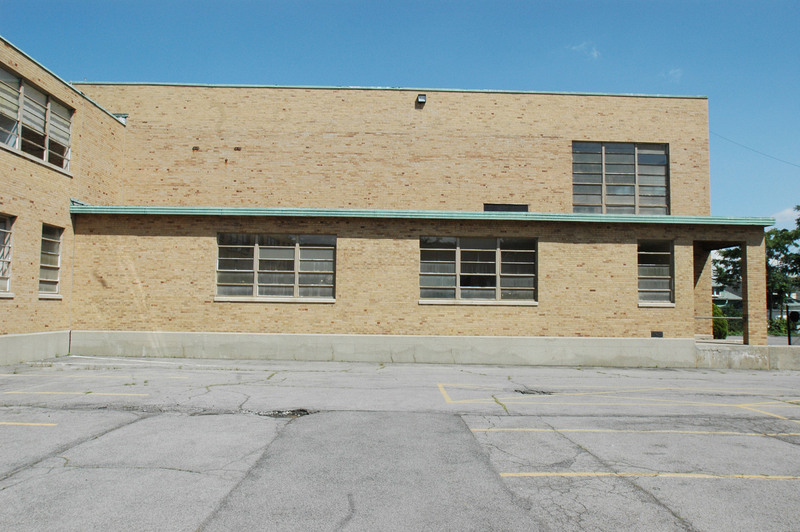 The Seneca Math Science Preparatory School reconstruction was part of the $1.4 billion Buffalo Public Schools Reconstruction Program aimed at modernizing the city school system. Seneca Math Science Preparatory School is a grade 8-12 program with a focus on Math, Science and Technology which sits on the East Side of Buffalo, a neighborhood with high rates of crime, drugs, perpetual poverty and many of Buffalo’s underperforming schools. This school has been able to gain a foothold against those odds, and an expectation that their students will indeed attend college. 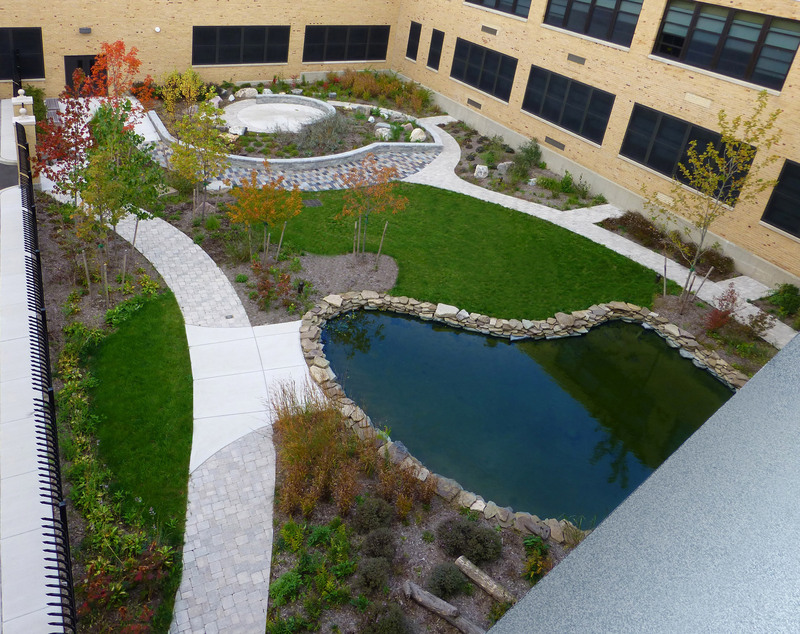 The courtyard elements were developed alongside faculty and the principal meet NYS Regents level science lab practicals, and provide ecosystem elements such as: a pond, stream, rain garden, meadow, forest and mountain areas. These ecosystem areas can be used to meet each grade level’s curriculum needs and to bring their successful curriculum focus to the outdoors. 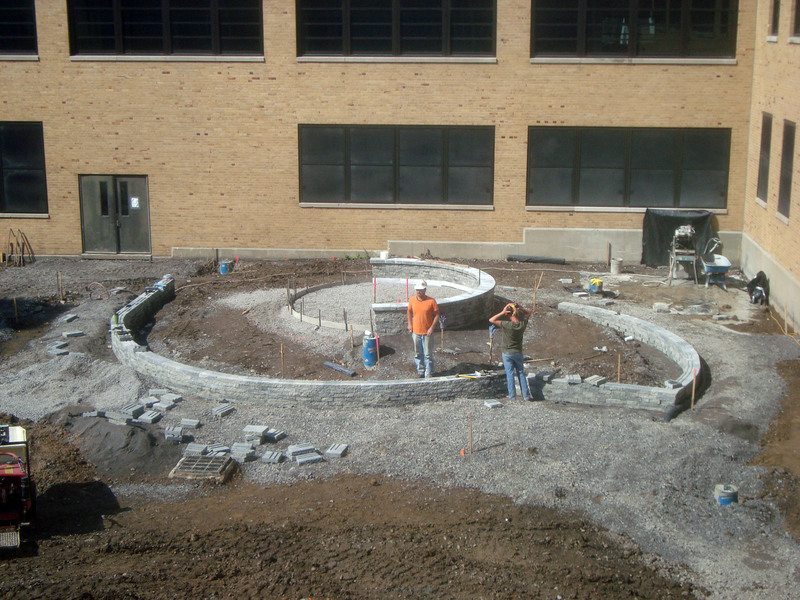 Each ecosystem area was designed as the armature for NYS Regents Science Lab Practicals and to provide the opportunity for faculty to design classroom experiences around the space. 3’ deep, bedrock below, walkway needed to rise to allow appropriate depth for pond but overall ADA accessibility needed to be maintained. Intentionally a limited filtration system to allow pond to react naturally to environmental conditions. 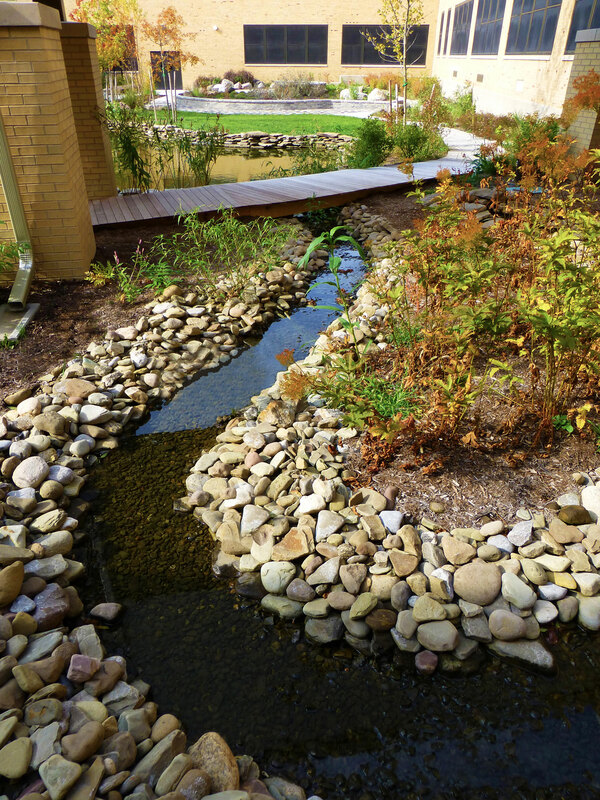 Water circulation is maintained from the bottom to allow the pond to function separately from the stream when desired and to more closely mimic a natural pond. 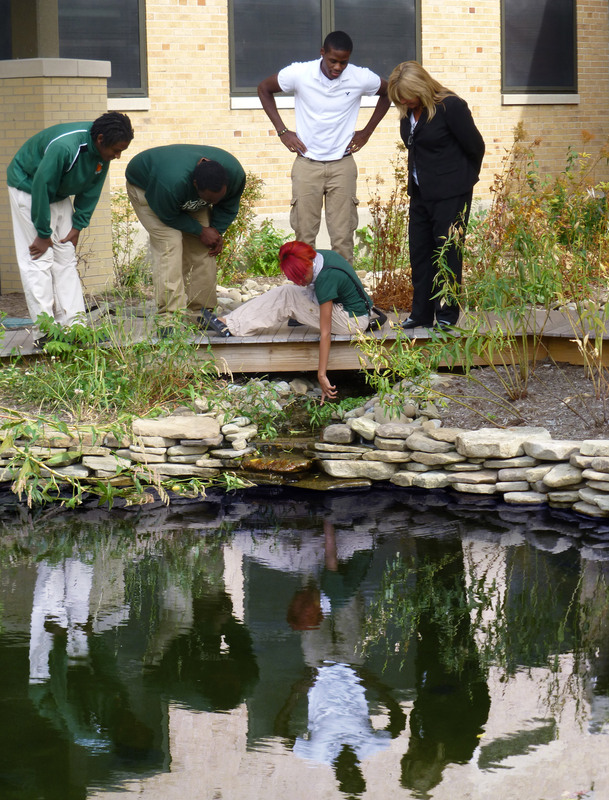 Large open lawn and accessible path to one side allows for student access to the pond for observation and sampling. As stream ecosystems are different from Pond systems it was important to provide an opportunity to study both. Winds from filtration pumps and double backs before dropping into the pond. This length of stream accommodates both large and small groups for study. Stream is also accessed from a wooden bridge spanning the confluence of stream and pond. 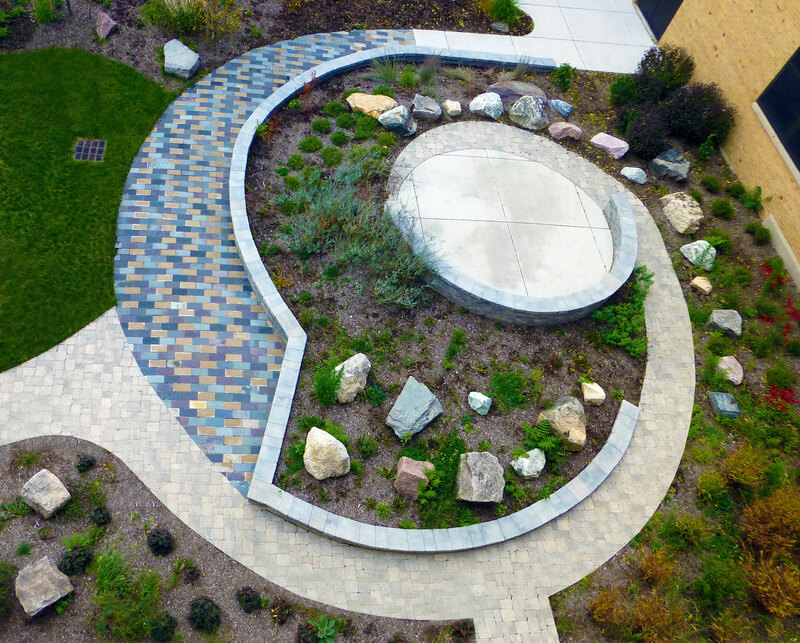 Stormwater management from an overhead structure is accommodated through the use of a rain garden. Soils conditions in this area purposefully poor quality to allow for soil testing and to observation of plants that perform poorly or well in a variety of soil conditions. Largely made of native species, or species that are beneficial to insect and bird populations. 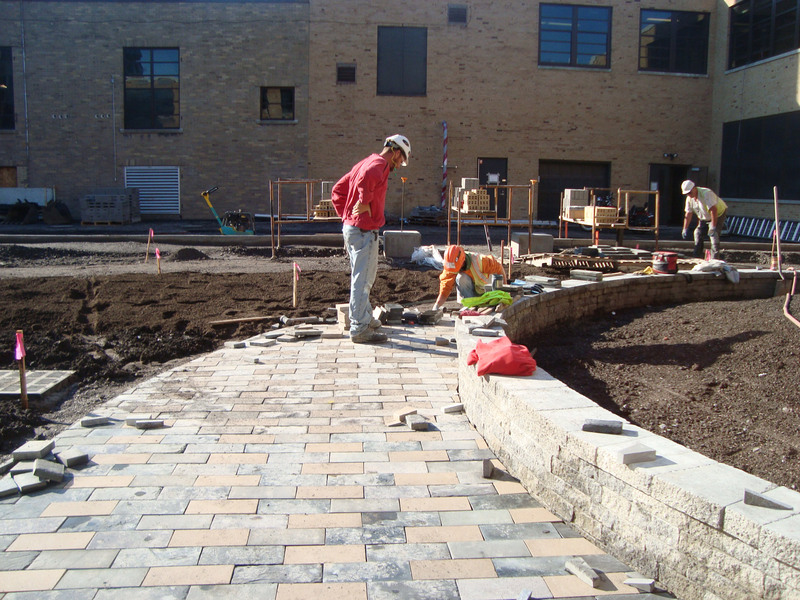 Trees selected for the courtyard are intentionally challenging to identify between one another. Shrubs throughout the courtyard also intentionally selected to be challenging to identify. Trees and shrubs selected to highlight a variety of plant structures, seasonal interest, benefits to habitat diversity and the environment. The Mountain area provides an opportunity for students to see examples of Igneous, Metamorphic, and Sedimentary rock types, and are arranged to provide a “mountain top” experience through moderate changes in elevation. Specimens are presented in both a natural rock formation and in a cut paver application, allowing the students to see the grain of the stone and how it varies between rock types. 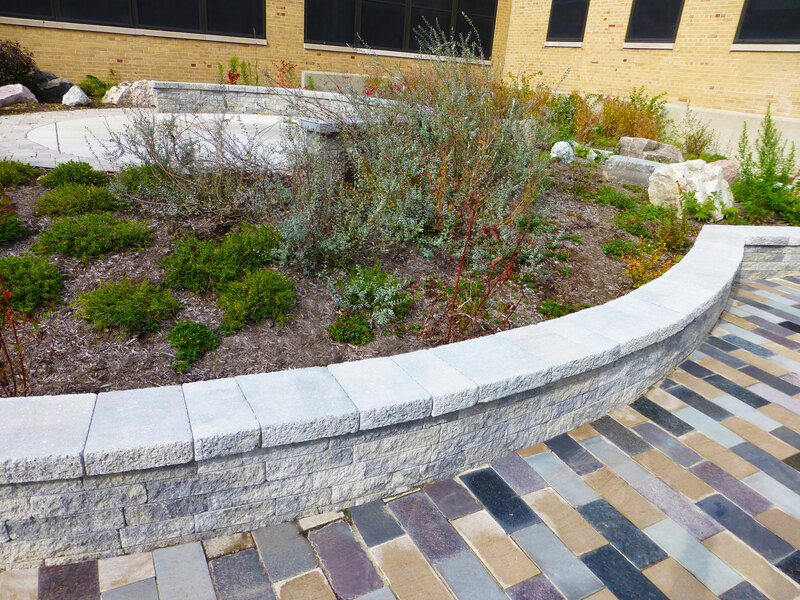 Selections of rock types throughout the courtyard are intentionally challenging to identify between one another.